The Family Literacy Tracking Program is a new database system with full tracking and reporting capabilities, which are easy to learn and master. 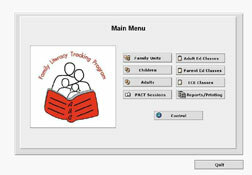 This all-in-one program offers you a fast, convenient way to manage your literacy program. This system maintains all required data for all CA Even Start modules: C.A.S.A.S., E.S.P.I.R.S., P.A.C.T./I.L.A., Home Visits, Parenting & Adult Education,E.C.E. and D.R.D.P. The New Teacher Support Tracking System helps the BTSA program coordinators keep track of beginning teacher requirements as well as plotting their progress. For example: training attendence, credentials, and the forms completed. 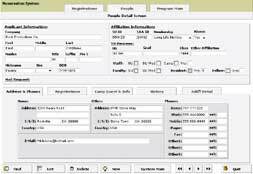 Other features include tracking of support-provider forms and training, periodic updates and reports for site administrators, and generation of BTSA Retention Data Forms for distribution. Reservation is a sample of one of the many types of Reservation systems specifically designed for client needs. These systems typically track the number of guests, types of transactions in addition to handling guest reservations and providing a variety of reports.